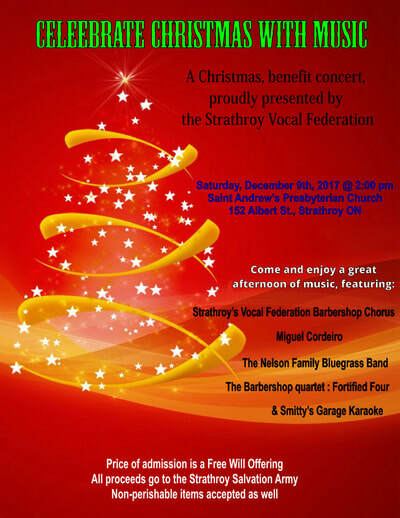 This year, due to scheduling conflicts at our usual venue for the Benefit Concert, we were forced to hold the Christmas Benefit Concert and the Christmas Dinner/Awards Night at Saint Andrew's Presbyterian Church on Albert Street in Strathroy, both on the same day. 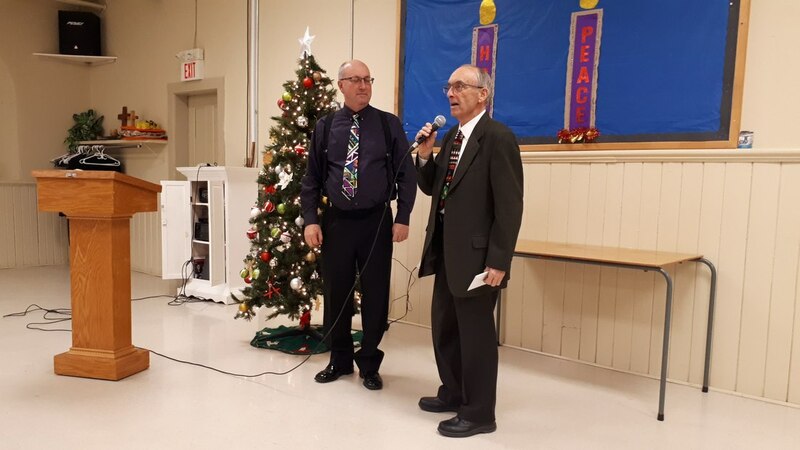 Our director, Mr. John Gough led the audience in a singalong of Silent Night and Angels We Have Heard On High, while they were being accompanied by Adrian Williams on the piano. This was followed by the toe-tapping, bluegrass sounds of The Nelson Family Bluegrass band, featuring the mother of the family, Susan Nelson playing guitar and singing lead vocals, with her younger son Charles playing mandolin and guitar, and her older son Sam on bass. Pete Atkins completed the family band bluegrass sound with his banjo pickin'. 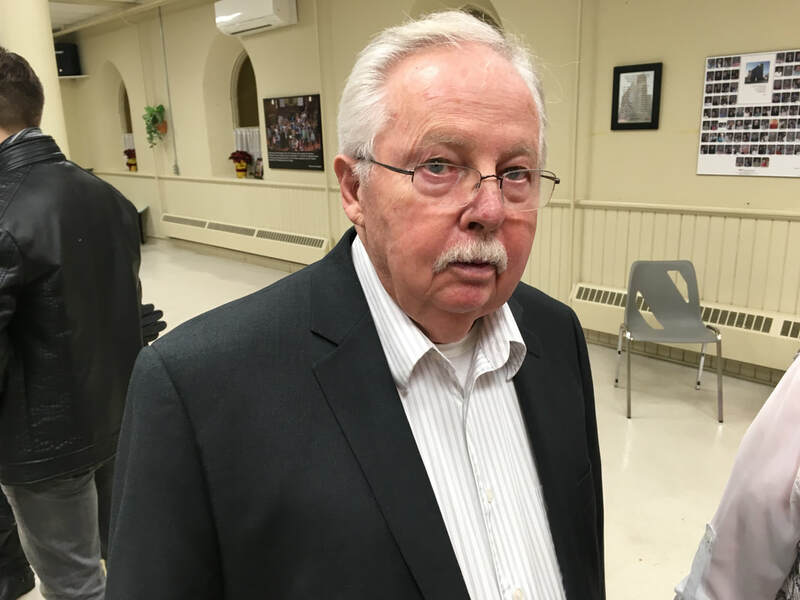 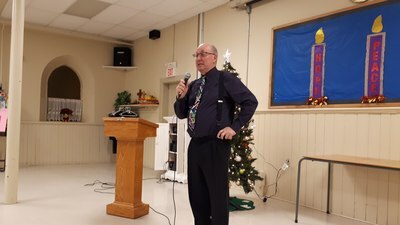 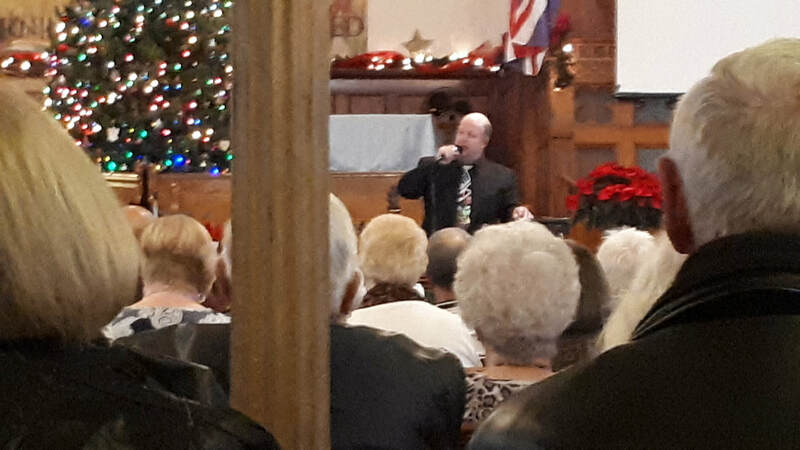 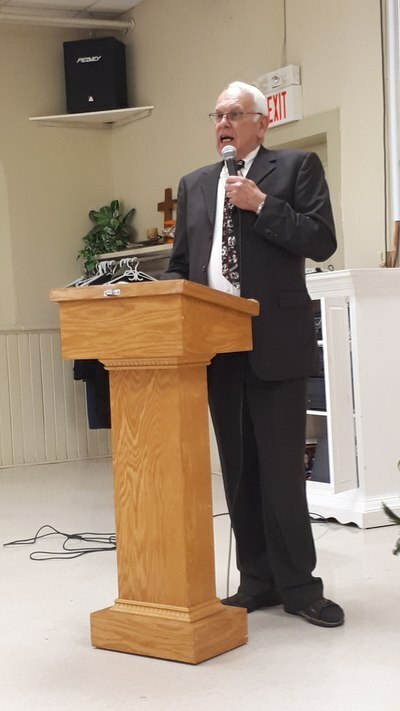 A member of the Strathroy Vocal Federation, Mr Dan Smith then took the stage, calling himself Smitty's Garage Band, and sang us a few old and memorable songs in Karaoke style, showing us that he could do more than sing bass in a barbershop chorus. 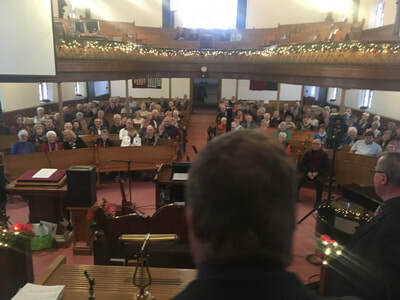 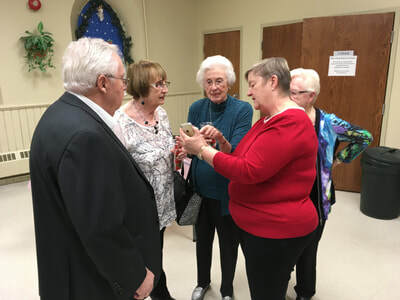 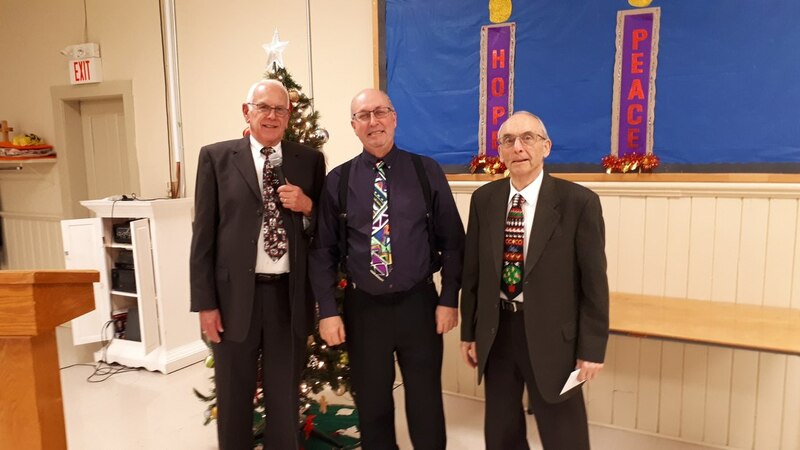 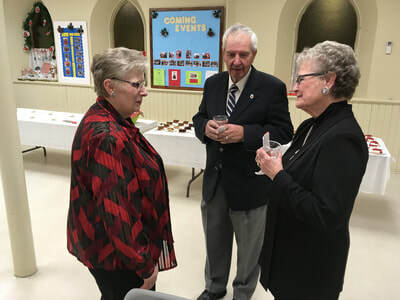 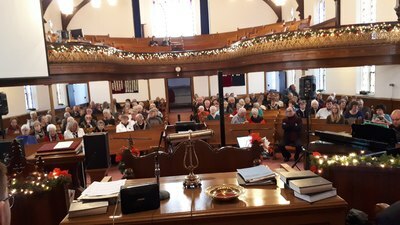 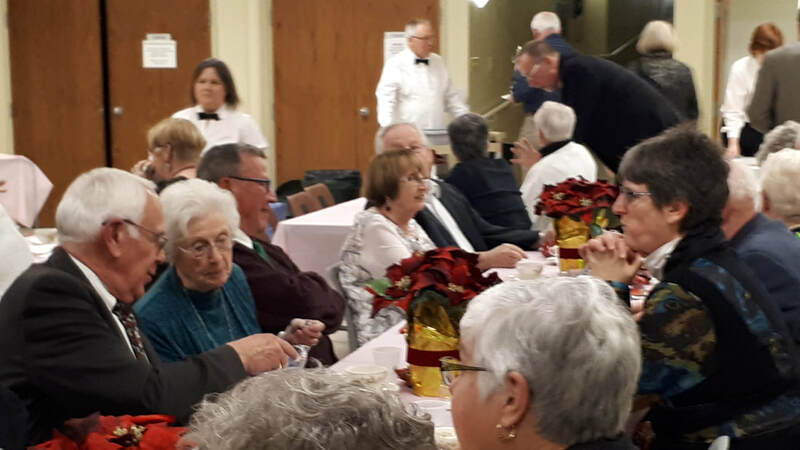 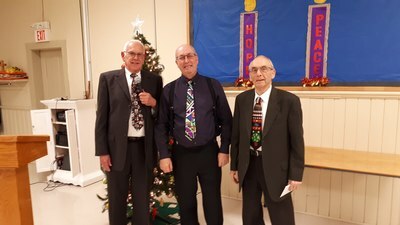 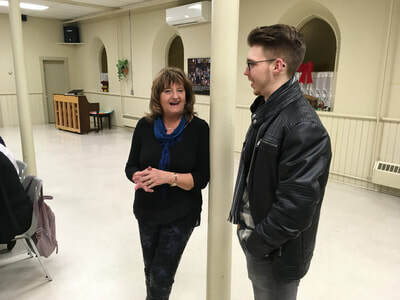 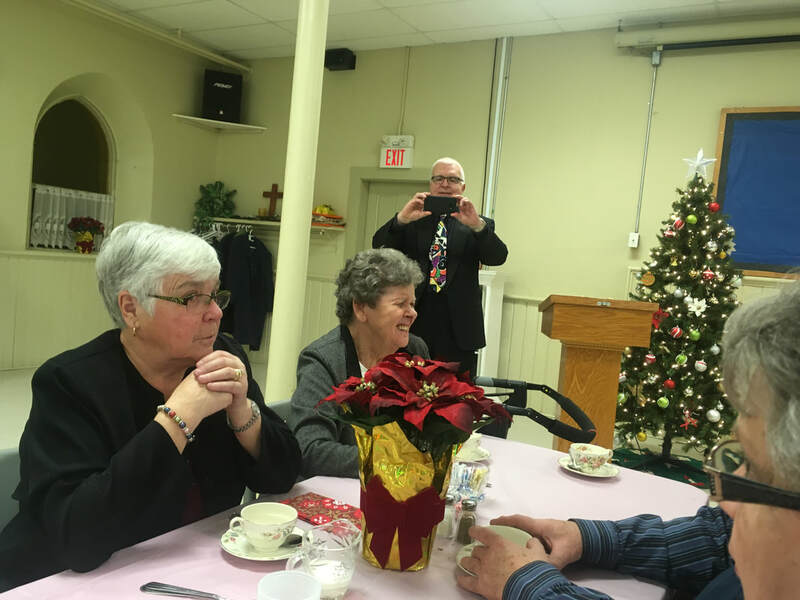 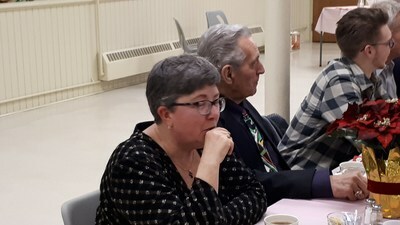 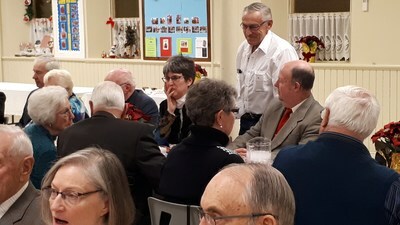 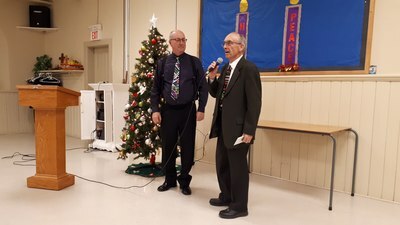 The proceeds to the amount of $1200 was presented to Major Roland Shea of the Strathroy Salvation Army, and then the Vocal Federation finished things up with three more Christmas songs. 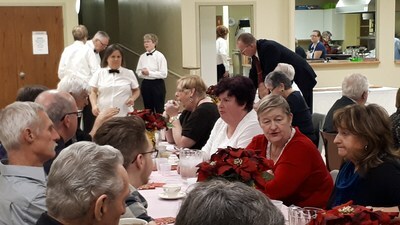 The concert finished shortly before 4 PM and the our Christmas Dinner/Awards night started off downstairs with a happy hour at 5 PM. 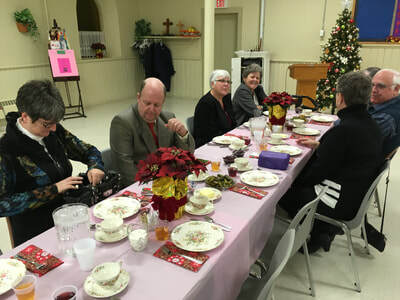 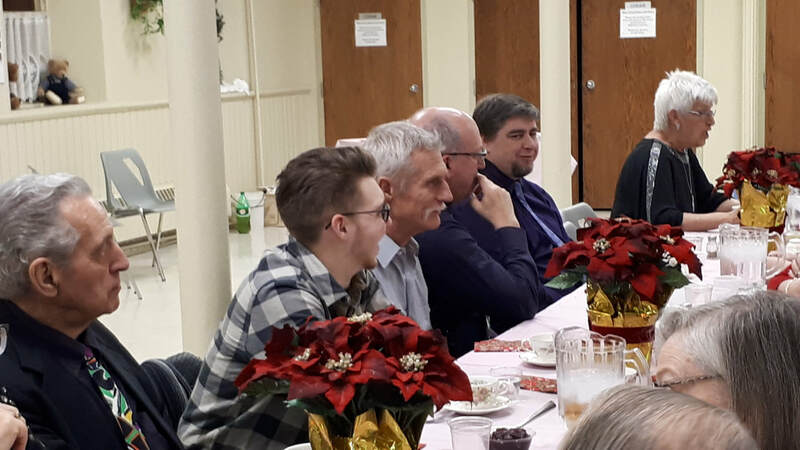 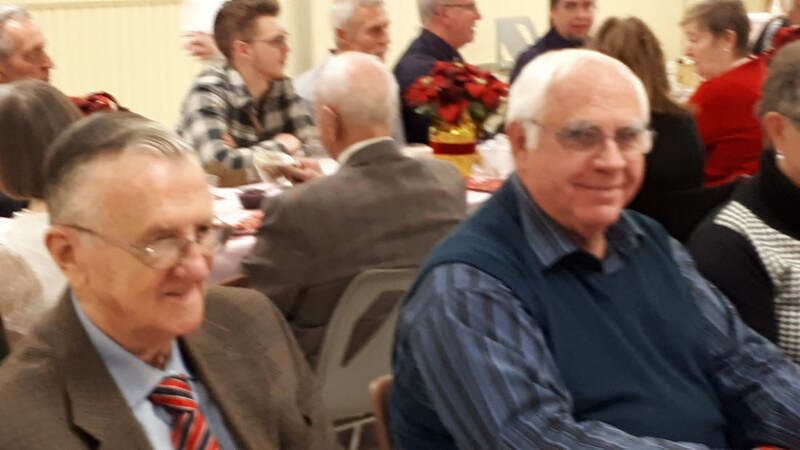 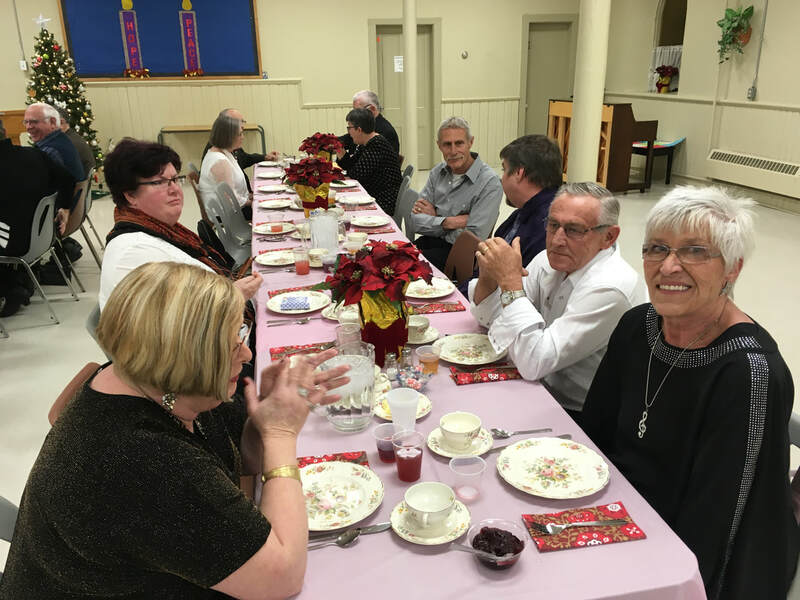 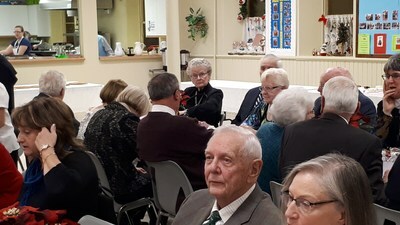 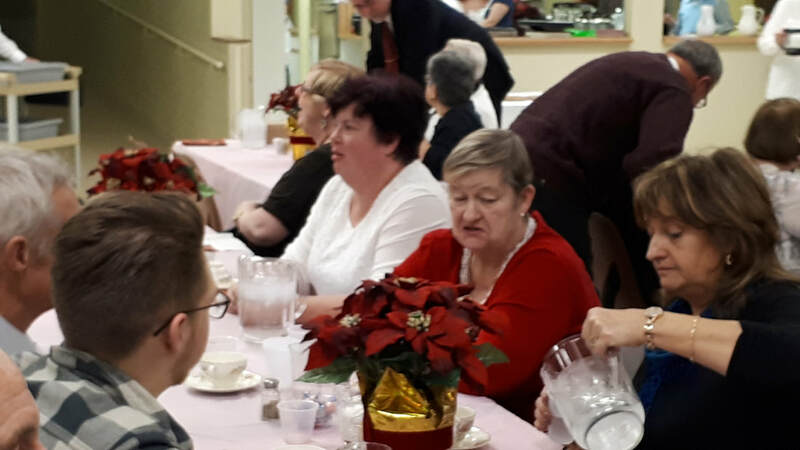 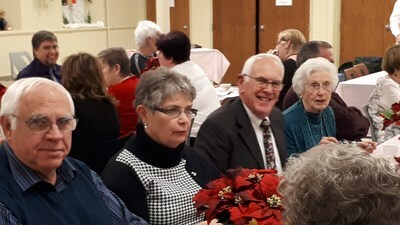 At 6 PM the Strathroy Vocal Federation with their wives, were served a very good turkey dinner put on by the members of the Saint Andrew's church. 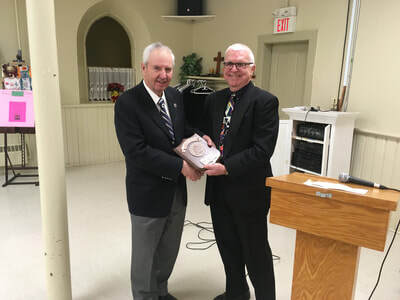 ​A Member Achievement Award was given to Larry Driessens by Orval Allen. This was in honor of the many good things that Larry has done for us over the past year as President. 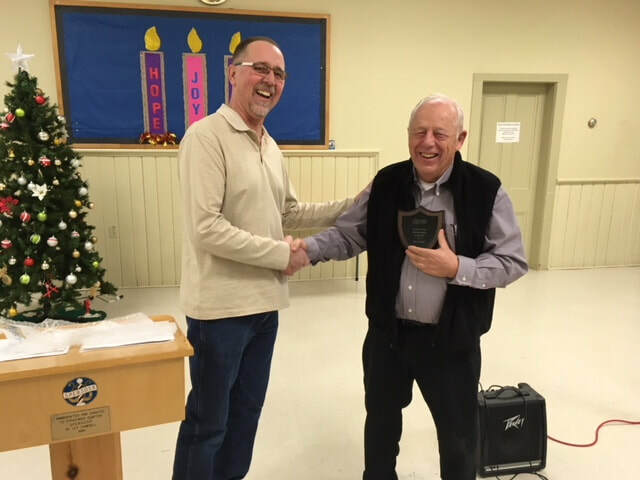 A "Hall of Fame" Award was given to Bill Galbraith by Doug Morley, in honor of being basically, a very nice guy throughout the years since our chapter was first started. As Uniform Chairman, Bill has kept us dressed to the "T" with our tuxedos and what not, and allowed us to store our trailer on his property. He has also dedicated himself to personal advertising and ticket sales for our annual shows. 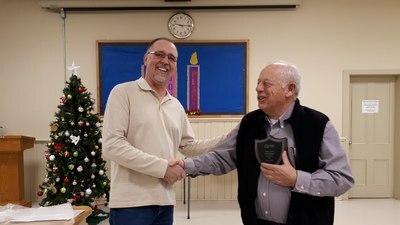 ​Finally, John Gough and Roswell McPerson received Honorarium gifts in appreciation for their direction services through the year. Henry Naus was unable to attend the Christmas Dinner/Awards Night so, at our next regular, Wednesday night gathering, Larry Driessen's presented Henry with the Barbershopper of the Year Award. 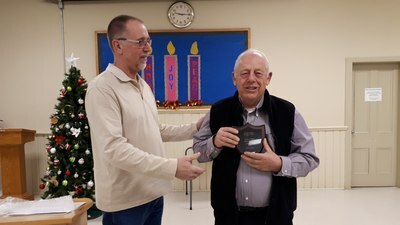 Henry is so deserving of this award due to his annual efforts made towards the sale of show tickets and show program sponsor adds, and that's not to mention his smiling and greeting face that he offers to each and everyone of us at our Wednesday night, practice sessions. 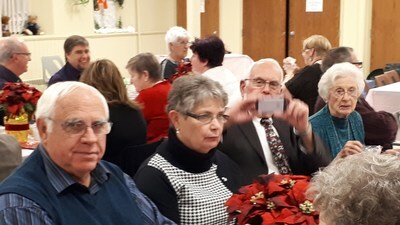 What follows are a number photos taken at both events by various's members with their cell phone cameras. ​Click on the first photograph to enlarge it and then click on the forward button ">" on the right edge of the image to move to the next photo, or click on the reverse button "<" on the left edge to move back. Jim Thompson acts as MC for the night. Our President, Larry Drirssens, receives an Award of Achievement. 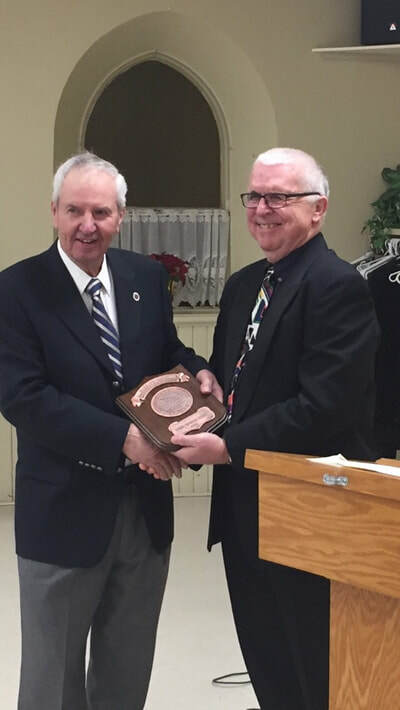 Bill Galbraith receives the Hall Of Fame Award. 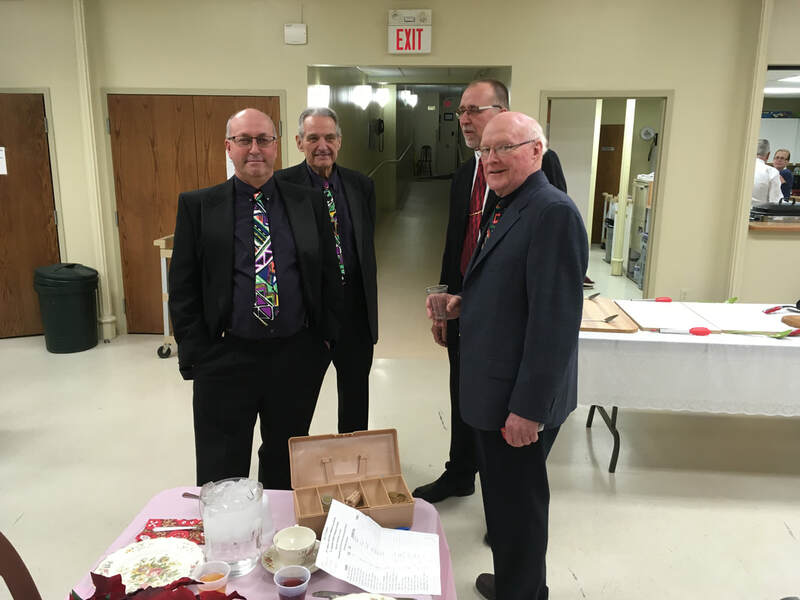 Honorarium gifts given to John Gough and Roswell McPherson. 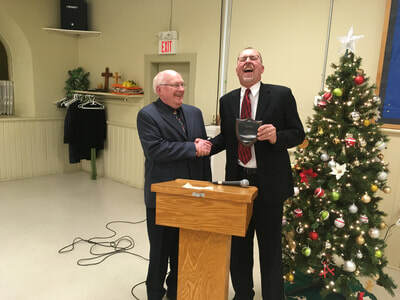 Roswell McPherson accepts and gives his thanks for the gift. 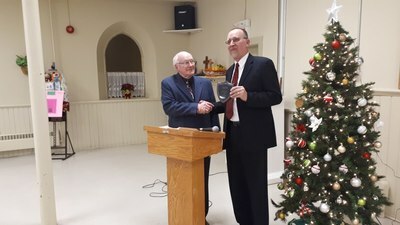 John Gough accepts and gives his thanks for the gift.